When we use Kindle Fire tablet, we would meet these situations: the Kindle Fire is stuck, the Kindle is locked and we forget the password, the Kindle screen is frozen, can’t connet Kindle Fire to WiFi, need to back to factory settings, can’t charge the Kindle Fire, the Kindle Fire won’t rurn on, can’t download or sync contents, and so on. In fact all the problems above have the same possible solution: reset the Kindle Fire. So in this article, I will introduce how to reset each generation of Kindle Fire tablet. This solution can solve these problems: can’t connect to WiFi, can’t download or sync contents, need to reset all contents. After activating the system menu, click “Settings”. On “Settings” page, there are two parts: “Device” and “Personal”. At the bottom of “Device” part, you shall see “Device Options”. 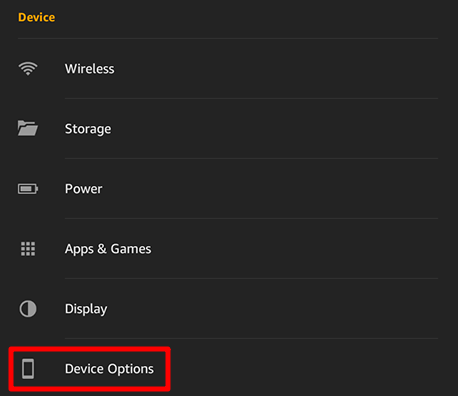 Entering “Device Options”, tap on the “Reset to Factory Defaults” option. Then you’ll see the alert window. You can figure out what will happen in the alert window’s warnings. Please read it carefully before tapping on “RESET” button. After clicking “RESET” button, the resetting process will start, the Kindle Fire will reboot automatically, and all installed apps, downloaded books, videos, will be gone. However, don’t panic, all your purchased contents are still stored in your cloud library, you can re-download them anytime you want. Sometimes you may forget the password (or we call it PIN code) for unlocking Kindle Fire’s screen. You can reset it in two ways. If you know the registered Amazon account’s password, you can reset the screen lock password with Amazon account’s password. 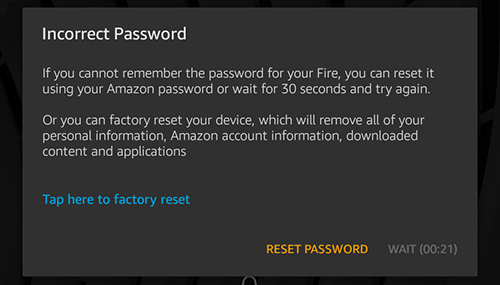 If you don’t know the registered Amazon account’s password, you can only reset the screen unlock password by “Tap here to factory reset” option. If choose this one, your Kindle Fire will be reset to factory defaults, all downloaded contents will be gone. If your Kindle Fire is frozen, or you even can’t light the screen up, then there is no way to back the Kindle Fire to factory settings. In this situation, you need to force reset the Kindle Fire. This method can solve these problems: Kindle Fire is stuck, can’t turn on, won’t charge, infected by virus. To force reset a Kindle Fire is simple, you just need to press and hold the power button for 20 seconds, then the screen will go black. When the Kindle Fire is stuck, the screen looks in gray, so you can easily figure out if the Kindle Fire’s statues has changed. Then please hold the power button for 2-3 seconds to turn it up.